Kindergarten is a great place for children to learn more about the importance of environmental sustainability. Warm and gentle, hardworking honey bees are our environment’s true superheroes. As they buzz about from one brightly coloured flower to another collecting nectar to make honey, they are also playing a very special role in food production - pollenating the flowers of over 100 fruits, vegetables, nuts and seeds. 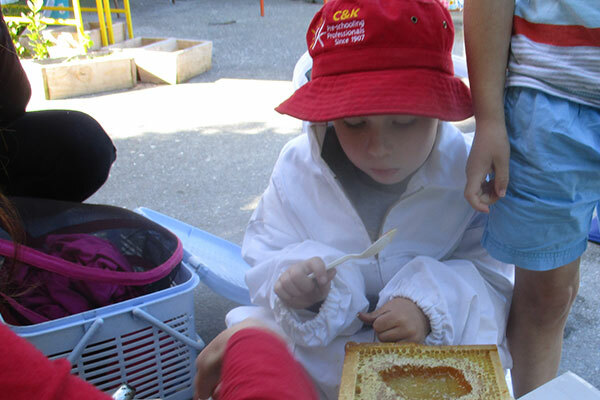 Kidsfirst Karoro have recently explored the humble honey bee, to discover more of an understanding about our important flower pollenating friend. 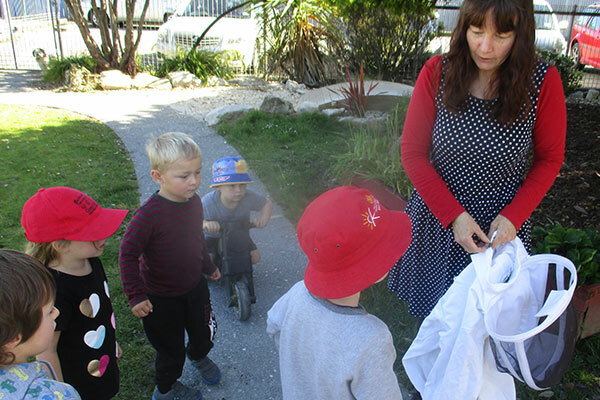 It also fits well with the kindergarten spirit of Kaitiakitanga (guardianship) – learning ways to take great care of our natural environment, have sustainable practices, and look after what has been entrusted to our care. Sue explained lots of interesting bee facts to our inquisitive young learners. Like that our little black and yellow-jerseyed buzzers are busy collecting flower nectar to produce honey back at the hive. Not only to feed baby bee larvae but also to store and sustain the family swarm through the long winter months before spring flowers bloom again. A typical beehive can house anywhere from 30,000 to 60,000 female worker bees, industriously making honey, with a single Queen bee, to lay eggs, and up to 200 male drones. Bees work very hard to make honey - with one single jar of the sweet, golden stuff requiring a visit to more than one million flowers! Her ‘flower’ point presentation waggle dance communicates three important things to fellow nectar harvesters. The angle of the waggle shows the direction of the flowers in relation to the sun, the rapidly vibrating abdomen communicates distance (the longer the buzz the further away the flowers) and, thirdly, the pockets of pollen collected on her hind legs provide scent cues about flower type for other bees to smell. After intently watching the dance presentation, several sisters will return with the original scout bee to forage in the new found flowers, in turn bringing back more pollen and spreading more bloom news throughout the hive – all in the name of honey making! That’s where the wonderful bee suit comes into play. 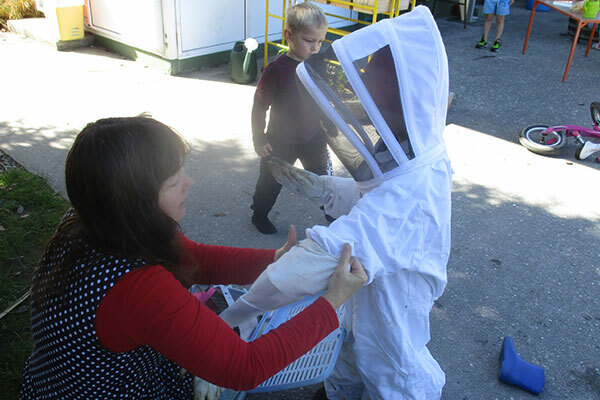 Reid was excited to model a long-sleeved, white, zip-up bee keeper jumpsuit complete with hood and veil, to prevent bee stings. 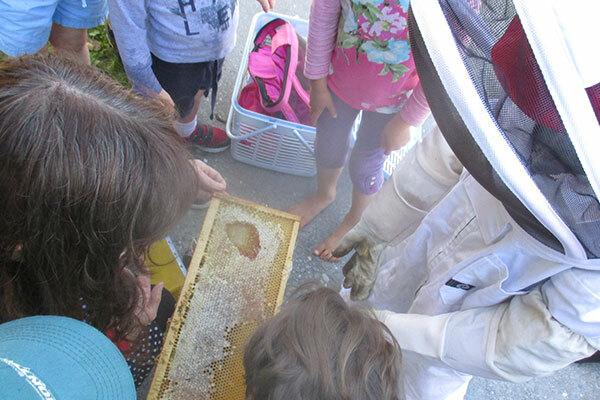 Sue showed children another important piece of equipment - a smoker - that makes bees drowsy and less angry during honey harvest. She also brought along a frame from one of her beehives to show what a honeycomb looked like and so everyone could taste a dab of delicious, sweet honey. Bees build honeycomb hives from hexagonal shaped connecting cells that not only store nectar but also house their young. Capped and sealed with special beeswax a cell full of honey nectar is stored and preserved as a fresh, golden food supply to sustain the whole hive throughout the seasons. A good beekeeper will never harvest all the honey but leaves plenty for the bees.